Psychologists have been trying to understand the factors that underpin children's success and failure in different educational domains for many years. One psychological function that has been found to play an important role in educational achievement is 'working memory', the processes involved in the temporary maintenance and manipulation of information. This book provides the reader with an up-to-date review of the research that has identified how working memory relates to academic attainment in: reading, reading comprehension, arithmetic and writing, as well as looking at how children with difficulties relating to hearing impairment and attention deficits differ in terms of their working memory. 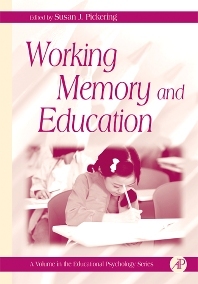 Other chapters focus on how working memory is called upon in classroom settings, how working memory can be assessed, and approaches to remediation. The opening chapter of the book provides an account of working memory from the architect of the model that has dominated psychological theory for over two decades. This book is a valuable resource for psychologists, educationalists, and anyone seeking to understand more about the cognitive basis of educational achievement in children. Cognitive, developmental and educational psychologists, both undergraduate and postgraduate, practicing psychologists (and trainee practicing psychologists). Educationalists and educators with an interest in psychology. Lecturer in Psychology, Graduate School of Education, University of Bristol, U.K.
Gary D. Phye, Past President of the Iowa Educational Research and Evaluation Association, is the new editor of the Academic Press Educational Psychology Book Series. He has published numerous research articles and book chapters in the areas of classroom learning and transfer. He previously co-edited two of the bestselling volumes in the book series: School Psychology with Dan Reschly and Cognitive Classroom Learning with Tom Andre. In addition to being the co-author of an undergraduate educational psychology text, Dr. Phye has also co-authored (with K. Josef Klauer) a newly-published program designed to teach and assess the inductive reasoning and metacognitive strategies of young children. Dr. Phye is currently working with the Ames Community public schools in the training and assessment of inductive reasoning strategies of special needs children in primary and intermediate grades.